My mission is to provide unparalleled service to all of my customers and clients, buyers and sellers alike. My formula for success is simple: it's about your success! A real estate transaction involves careful orchestration of many independent details. I am there to make sure that all of these details go smoothly throughout your home sale or purchase transaction. I considers it a privileged opportunity to work with all of my clients and offers dependable, quality and experienced service to each and every customer or client I assist. I look forward working and educating you through this process! As a top producing agent over the past 20 years, I have helped hundreds of families and individuals make sound real estate decisions.I am currently in the top 50 RE/MAX agents in the Central Atlantic Region /MD close of 2018. My first year of real estate I was crowned "Rookie of the Year" by GCAAR- Greater Capital Area Association Of Realtors. I am a distinguished member of the Council of Residential Specialists (CRS) which is considered to be the "PhD" of real estate in our industry, a Graduate of Realtor Institute (GRI), A Senior Real Estate Specialist (SRES) , and a proud inductee to the RE/MAX Hall Of Fame and Lifetime Achievement Recipient. I also hold the Accredited Home Staging designation (ASP) and will assist you in "Staging" your home for sale. Homes that are staged sell 3 times faster than those that are not. I use the most up to date technology to make your buying or selling experience a smooth one. I use all of the top real estate websites and tools to get your home sold fast such as Realtor.com,Homes.com, Zillow, Visual Tour.com, Homesnap, and more! I can explain all of these in detail to you at our first meeting! Lets face it ... we are in a digital world these days and it is imperative to have an agent who is up to speed on this type of marketing. 93% of home buyers and sellers find there home on the internet. So if your not represented there you are missing out! I am preferred vendor on all of the top real estate sites so you get maximum benefit and exposure if you are selling! I have been featured on FOX 5 TV (WTTG) as a preferred real estate specialist in the DC metro area. For buyers, a direct link to the local MLS makes searching a breeze and Homesnap will help You search for homes wherever you may be looking in real time! Lastly, I am a member of the Maryland Association of Realtors, Northern Virginia Association of Realtors, National Association of Realtors, Greater Capital Association of Realtors, and RE/MAX International. 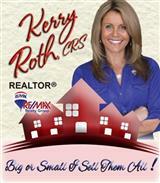 Please feel free to contact me directly by email at kerremax@gmail.com or by phone at (301) 518-0994.